One of my regular readers, currentdescendent, is doing a great project that I wanted to share with you, a multi-part story about her grandfather. Luanne has been blessed with an interview with her grandfather that was done about five years before he passed away. She has taken this interview and broken it up into short parts and then expanded on the interview with stories, photos and memories of her own. Great job Luanne! 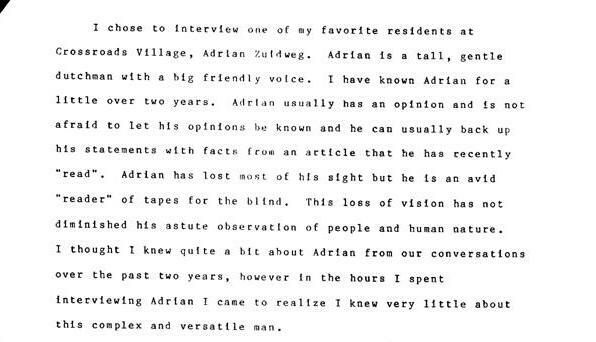 In 1994, five and a half years before he passed away, my grandfather, Adrian Zuidweg, was interviewed by Connie Jo Bowman, the head of residents at Crossroads Village, a retirement community in Portage, Michigan. Connie was taking a course about the elderly at Western Michigan University and chose Grandpa as her subject. I’ve written about Grandpa in a post about our left-handed connection. The entire interview is eight typed pages, so I’ll divide it among a few blog posts. This entry was posted in DOABLE approach, step 4: build, Storytelling and tagged Family, family history, family stories, Genealogy, Grandparent, Online Writing, sharing family stories. Bookmark the permalink. Thank you so much for the re-blog! As you know, I love your blog, so this is a big honor!! You are so welcome. I really do like what you are doing with you grandfather’s story. Keep up the good work!